Hailing from good ol’ Salt Lake City, Wings of Normandy have been busy with a brand new album, Bitterroot, released on their own label, Narwhal Records. They’ve been making a dent in the alt-folk scene, sharing the stage last year with Rural Alberta Advantage, a Saddle Creek staple, as well as a slew of other local talent including Ferocious Oaks, which also features a member of Wings of Normandy. 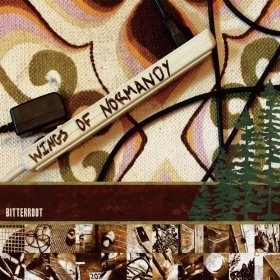 Bitterroot takes its toe-tapping, feel-good cues from the likes of Fleet Foxes and Band of Horses, while songs like “Lonely Love” and the title track take it down a notch, sounding heavily influenced by Rocky Votolato. There are good things to come in Wings of Normandy’s future—their instruments are solid, while the lyrics are thoughtful and fun enough to sing along to. I’ve got high hopes for these guys and am anxiously awaiting their next endeavor.